Photo: George Earhart House (Arrington House, Miller House), ca. 1840, Route 712 near Route 723, New Ellett, VA. Listed on the National Register of Historic Places in 1989. Photographed by user:Skye Marthaler (own work), 2013, [cc-by-3.0 (creativecommons.org/licenses/by/3.0)], via Wikimedia Commons, accessed February, 2014. The Montgomery County Courthouse is located at 755 Roanoke Street, Christianburg VA 24074; phone: 540-382-6954. Montgomery County is located in southwestern Virginia between the Blue Ridge and Appalachian Mountains. The western portion of the county is drained by the New River and the eastern portion is drained by the headwaters of the Roanoke River. The eastern continental divide bisects the county from north to south. Based on archaeological evidence, the New River Valley was inhabited by prehistoric Native Americans for a great period of time from approximately 15,000 B.C. to 1580 A.D. Very little is known of these early dwellers because only a limited amount of archaeological research and testing has been conducted. The upper reaches of the Roanoke River in Montgomery County are included with the New River Valley in this narrative. There are few differences in archaeological remains from the two river systems. Despite the fact that limited research has been conducted in the region, we still are able to interpret the past by making comparisons of local sites with those of other parts of Virginia and nearby states. These comparisons, along with the local research that has been conducted, give an increasingly clear picture of past lifeways. Human occupation of the Montgomery County area has been nearly continuous since as early as 8000 B.C. Sites may date back to previous millennia during the Paleoindian period. Permanent settlements may date as early as 1200 B.C. during the Woodland period. After about 1600 A.D., there was increasing contact with Europeans. Near the end of this period the New River Valley seems to have been largely abandoned, except for hunting parties passing through. The burning of large portions of the area to promote an open hunting, planting, and grazing area may have been practiced. When the early expedition led by Thomas Batts and Robert Fallam reached the New River Valley they noted extensive clearings and abandoned cornfields along the river. Batts and Fallam explored the area in 1671, on an exploratory trip sponsored by the colonial government and private interests. The land comprising Montgomery County was claimed by the British Crown and by Virginia long before white men actually entered it. At the time of the area's earliest settlement in the early 1740s it was a part of Orange County. In 1745 Augusta County was formed from Orange, and it included Montgomery until the formation of Botetourt County from Augusta in 1779. After 1772 part of the county was in Botetourt County and part in the new county of Fincastle. In 1776, due mostly to the agitation of its westernmost inhabitants, Fincastle County was dissolved and three counties formed from it: Kentucky, Washington, and Montgomery. Montgomery stretched from the North Carolina border to the Ohio River. 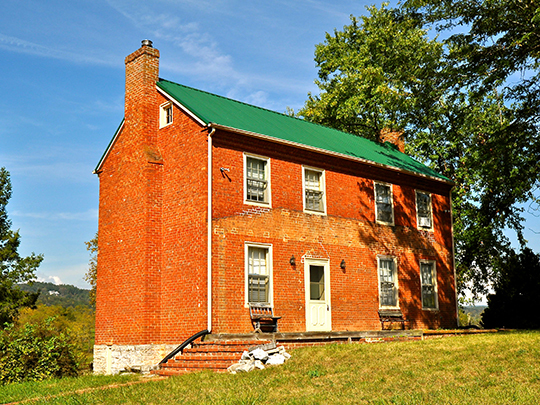 The county seat was established at Fort Chiswell in present Wythe County and the first county court convened there on January 7, 1777. The formation of Wythe County in western Montgomery in 1790 necessitated the removal of the Montgomery County seat. By 1791 the court was meeting in a new courthouse in the new town of Christiansburg. During following decades several counties were formed from Montgomery and by 1839, when Pulaski County was formed from the western portion of Montgomery and the eastern portion of Wythe, Montgomery County had assumed roughly its present form. Worsham, Gibson, Architect, Prehistoric and Historic Resources of Montgomery County, Virginia,, nomination document, multiple resource area, 1986, National Park Service, National Register of Historic Places, Washington, D.C.